There were eight of us in a restaurant in Vientiane, from all over Southeast Asia, socializing after a meeting that had filled the day. The Belgian leant over the table to the Cambodian and said: What was it like for you during the Pol Pot time? Very direct, the Belgians. It was a question I would never have asked, but let’s be honest, of course I wanted to know the answer. So Pheng told us what it was like for him during the Pol Pot time. That evening in the Silapa Restaurant in Vientiane I had no way of writing down what he said, but next day we had a five-hour stopover in the airport in Bangkok, and in the airport restaurant I asked him to repeat the story. This time I had paper and pen and I took down his words as accurately as I could. Every so often he had to ask one of his colleagues to suggest the English word he needed, but mostly these are his own words. 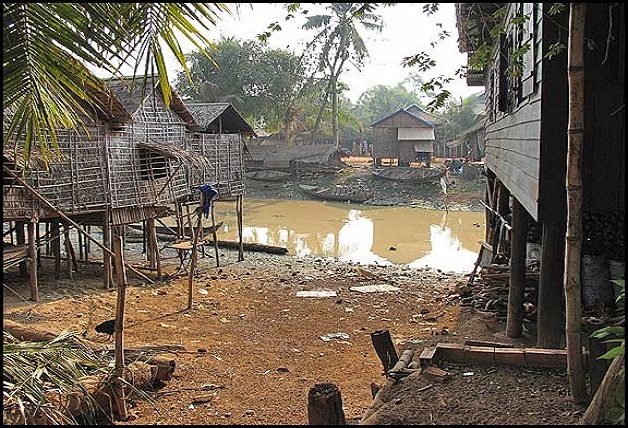 I worked in Kompong Thom, north of the Tonle Sap lake, under the Lon Nol regime, on the staff of the Ministry of Rural Development and Refugees. I was married in 1975 January, in Kompong Thom province, and after two months the Pol Pot win the war. They take out the people outside the town to the countryside to be a farmer to grow rice. At this time I am living with my wife and my baby daughter in a village called Mango Island, in Kompong Thom province, near the village of my wife. They order me to plough the field for the rice, far from the village, maybe 10 kilometer, but I cannot control the buffalo. So when the Pol Pot see I cannot plough the field they order me to catch fish for the group. Then they bring us back to a place 2 kilometer from Mango Island and tell us to plough there, and after that they make a new move, but this time not normal, bring no bags, and on the way is one tree, and my skin is feeling goose bumps, and I fear maybe they bring me to kill, and the Pol Pot chief is there with three guards, and one guard has a knife and an axe, because Pol Pot they not shoot, they kill by a knife and an axe. When we come to the place there are twenty of us, they have our names. The chief of the Pol Pot talks to us, he says the Organisation will provide us each a white suit today. I know this means a cloth for the dead. They start to call us in to the room, one at a time. They don’t want anyone to see, they not want anyone to know. They kill with the ax and the knife. So I say to the guard that I have forgotten my bag with my clothes, Oh, I say, I am stupid, I forgot my bag, someone will find it. So he thinks that someone will find my bag and they will know what has happened. So he says to me to go quickly and get my bag. I run and when I am out of sight I jump down into a hole. (Kuon Pheng is struggling for the right word. Not a hole. His colleague translates: Kuon Pheng means a ditch, the deep ditch that his work team was digging as part of the irrigation scheme of the Khmer Rouge. The ditch was two meters deep and perhaps two kilometers long). So I jump down into the ditch, and I run. I run bent over, no one can see. I run and I run until I come to the end of the ditch, then I walk along the national road to the village of my wife parent. When I tell them what has happened, at first they not believe me, they want me to go back to Mango Island, but after they see that I am so frightened they believe me. They make me some rice and my wife brother write a letter saying that I am ordered by the Organisation to go to work on the ditch in another place. So I start walking, I am going to my own mother land in Kompong Cham on the Vietnam border, on the other side of the Mekong River. At first I come to the Pol Pot checkpoint. The guard takes the letter that my brother in law has written, he turns it and turns it, he cannot read. So I tell him it is to say I am to go to work in another place. But he sees there is no number. My brother in law forgot to write a number on the letter, every letter must have a number. So the guard is angry, he say, You are lying, you are a spy! So I am afraid, and I cry, and I say, I am not a spy, the chief of the Pol Pot forgot to write the number, and the guard believe me and let me go. But I am afraid and I decide I will only go at night, in the day I will hide. That night I follow the road again and I come to a river, and I not know how deep it is. I cannot use the bridge because there is a Pol Pot check point, so I go up a little bit and start to go down into the water. The water goes to my knees, and to my chest, and to my chin, and I am afraid because I cannot swim. But then the water starts to get shallow again, to my chest and to my knees, and I can climb up the other side. I stop there where there is a big tree and sun is rising and the birds are singing and the breeze is blowing in the tree and it is a beautiful day, and I miss my wife and my daughter, and I think I will go back, I miss them so much, I know the Pol Pot will know I am missing, and they will catch me if I go back, but for long I stay there and think will I go on or will I go back. That next day I hide again and come out at night and follow the road again. I have to be careful of the Pol Pot, but at night there are no people. I come to a pagoda, but there are no monks, the Pol Pot has sent them all away. In front of the pagoda are a lot of tombs. When I get there I meet a light, like that (pointing at the little spot lights in the restaurant ceiling), far from me ten meter, I think this is maybe Pol Pot posted there to catch people, but when I look it fly to me, and I am afraid. I sit down I close my eye. When open my eye he near me maybe two meter, and the light become the white hair, like this, (drawing a circle with long hair), and the face is blue, had no eye, had two hole, black, no eye, and the neck like a stick, and the body, and arms were sticks, but no hands, and the legs like sticks but no feet, and it is above the ground. The head is calm (holding his hand up to indicate motionless, unmoving), but the rest is moving (making a quivering motion with his hand), I cannot say in English. At that time I pray, my hands like this (joining his hands in prayer in the Buddhist fashion), I told him not to frighten me, that I escape from the killing, please help me to find the way to go to my village, and please take care of my wife and daughter, and at that time I stand up and I walk, and the ghost follow me about ten meter, and after I walk about 500 meter the ghost become a light and goes above and in front of me and guide me. That night the ghost guide me across the field across the pond across the jungle across the bamboo forest, no more the road. At daytime I sleep, I cannot see the ghost. I reach the bank of the Mekong, there is a lot of bamboo, at that time maybe about four o’clock in the morning, not yet light, so I see the boat and take this boat, this boat full of water but not yet leak down the river. I take this boat to middle of the river, I clear the water out (indicating bailing out the boat with his hands), I do this when I young so I know. So at this middle of the Mekong there is one island, and there are two ways (drawing a large island dividing the river into two branches). I would like to go this way, to the east, because this is my motherland, but the ghost-light is on the way near the island (that is, the channel to the west), but I try to go east, the ghost doesn’t follow me, and maybe 500 meter I have no way to go (drawing how the eastern channel turns into a dead end), so I go back, so I go the other way, and the light guide me again. And at that time of year there are so many cucumber, and the ghost guide me the bank, and in the field they grow corn and cucumber, and I cut young corn to eat and some cucumber, and put in my bag to eat, and at that time nearly daytime, so there is small trees near the field, and I sleep. The boys bring the cows, the Pol Pot go around there, but they not enter into the small trees, I think the ghost protect me. And at night I continue across the fields, and I reach a rubber plantation, and at nighttime the ghost is guiding me. 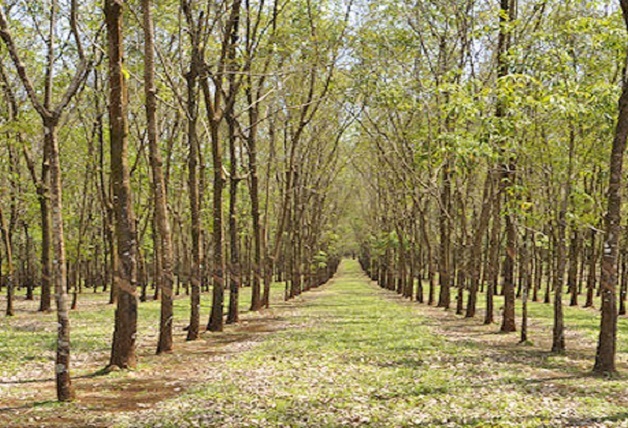 I cross the rubber plantation, maybe one night, and I know the rubber plantation is near my village, and I know the way to nearly reach my village. I remember that the road goes this way, (drawing a road exiting the rubber plantation in a straight line), but I am confused, I like to go here (drawing a second road forking off from the first to the right), to my village (drawing a small square to indicate his village at the end of the second road), but I lost my memory, maybe the ghost make me, I miss the road, I just walk through like this, and this the field, (drawing a large square beyond the fork in the road), and this another village and pagoda (drawing a symbol at the end of the road to indicate the pagoda in the next village), and I remember again when I see the peak of the pagoda, so I turn across the rice field, across the pond and another pond, and I go straight to my village. Later I find out there is a guard post of the Pol Pot on the straight road, if I go straight they will catch me, the ghost has found a way to escape me to my village. In my village I find my mother my father my brothers my sisters is pushed out, not there, but I have my relation there and they tell the Pol Pot that I am their nephew and so I stay with my aunt. I work there and stay there from 1976 till 1978 December when my village is liberated because it is near the Vietnam border. A lot of tanks cross my village, and Pol Pot ran away. In the commune office is a big book of names of people to be killed, my name is there, I am to be killed in January 1979. The 7 January 1979 all the country is liberated. 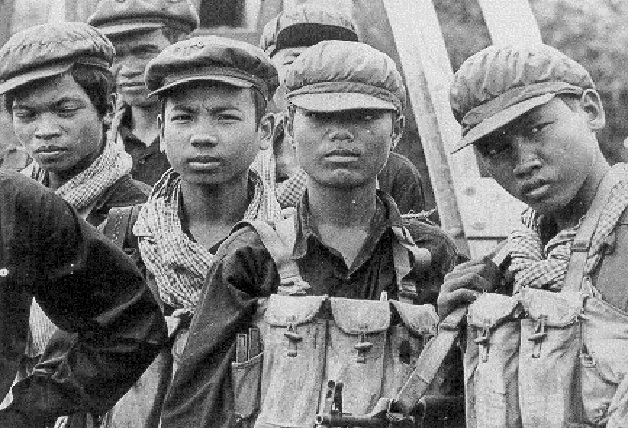 After we are liberated my mother and my father come back, but my three brother are killed by the Pol Pot. I go to Mango Island to look for my wife and daughter. When I meet my wife she cry, tears stream from her eye, she tell me our daughter die because of sickness and nothing to eat. I stay in Kompong Thom till middle 1979, then I go to Phnom Penh to find a job, and after three months I go back to Kompong Thom to bring my wife to Phnom Penh. Now I have three children, two boys and one girl. My daughter now is eighteen years old. Two years ago I went back to that pagoda where I saw the ghost the first time and I made a shrine to the spirits. It was six days and five nights that I was running from Kompong Thom to my village. The ghost came to me on the second night, and stayed with me till I came to the rubber plantation. Before this I did not believe in ghosts. When I was a child my mother told me stories of ghosts so I would not wander far. But at secondary school I learnt that the Earth goes round the Sun, and I believed in Science. But when I saw the ghost, I was so afraid, I had my skin like popcorn. Now when I think of the ghost, I have the same. In my admittedly-limited experience, ALL Cambodians believe in the supernatural. Ghosts don’t exist. Educated Khmers don’t believe in them either contrary to undoubtedly well-studied statement of “Uncle Monty,” though there are admittedly few with a real scientific education around. Thanks for your time. The supernatural is real. You weren’t there. Good sharing Brother, it is the sad story.